Thanks to his utterly bizarre yet completely transformative character work and penchant for pulling large-scale pranks, Andy Kaufman is exactly the kind of person who you would expect to fake their own death - and as a result has been the subject of many conspiracy theories ever since his reported passing in 1984. Hell, even director Milos Forman added an interesting question mark scene about Kaufman's death at the end of his 1999 biopic Man on the Moon. Now a new chapter has been written in the decades long conspiracy theory, however, and if this new report turns out to be true it means that Kaufman has spent the last 29 years of his living in obscurity with a wife and family. Defamer picked up the story from The Comic's Comic, and it's quite an interesting tale. 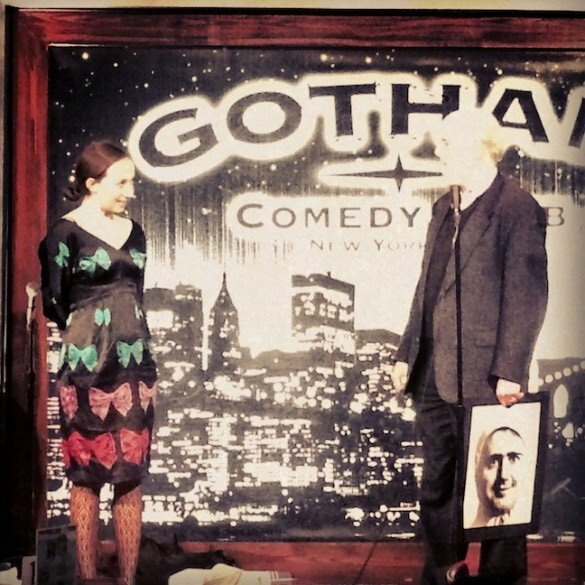 The story begins at the 9th annual Andy Kaufman Awards, which were held on Monday night at New York's Gotham Comedy Club. While on stage, Michael Kaufman - Andy's brother - began to talk about his sibling's legacy and then revealed that he doesn't actually know if Andy is alive or dead. He then told a story about how back in 1984 he was going through his brother's things and discovered an essay written by Andy about how he would go about faking his own death. The piece said that he would eventually reappear on Christmas Eve 1999 at a particular restaurant, and when that date came Michael went to the place to find out the truth. While Andy was a no-show, that night he was given a letter from a stranger that turned out to be a letter addressed to him from Andy. In the letter the comedy legend explained how he wanted to have a normal life and that "he'd met and fallen in love with a woman and had a daughter, and that he didn't want Michael or anyone to say anything while their own father was still alive." Andy and Michael's father, Stanley, died this past summer, and Michael told the audience at the Gotham Comedy Club that a month after the loss he got a call from a young woman who told him over the phone that Andy was alive and that he had actually been paying attention to the Andy Kaufman Awards "from afar" and was very proud of the event. Michael then asked the crowd if that young woman was in the audience, and then a 24-year-old woman stood up from the back and made her way to the stage. The report on The Comic's Comic, which was written by a writer named Sean L. McCarthy, doesn't mention exactly how this young woman was connected to Andy, but Killy Dwyer, an Andy Kaufman Awards finalist who was there that night, said in a Facebook post that the mystery guest was Andy Kaufman's daughter. Post by Killy Mockstar Dwyer. But what do you think about it? Do you think the legendary stand-up comic and Taxi star faked his death in 1984, or do you just think that it's a phoney conspiracy theory? Answer our poll below. Do you think Andy Kaufman could still be alive? No way. He's resting in peace. Maybe... I'm not so sure. Absolutely! I'd totally buy it. UPDATE: The Hollywood Reporter has received some quotes from Ed Cavanagh, showroom manager at the Gotham Comedy Club, and Al Parinello, the producer of the awards, who have confirmed what went down on Monday night. The former insisted that the event wasn't a hoax, saying "without a doubt this was not a prank," and the former, who is bit more unsure about the story, said that it was clear that Michael was emotionally impacted. UPDATE #2: Here's the video from the Andy Kaufman Awards featuring the young woman who claims to be Andy Kaufman's daughter. The clip is heavily edited and it's clear that we're not seeing everything that she said, but it's something. More info on the possible identify of the woman in the video is available here.